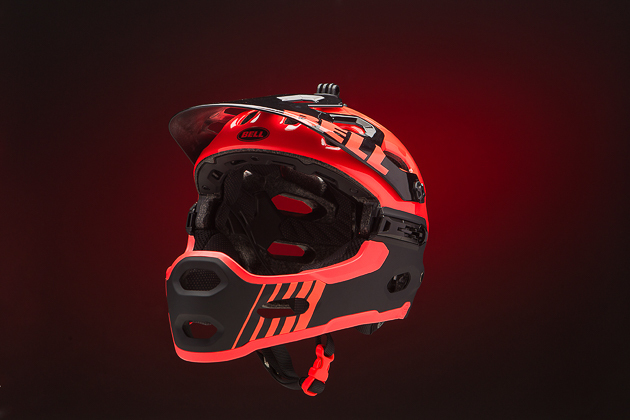 The Super 2R is truly a full-coverage all-mountain helmet. By cleverly attaching a chin bar using three svelte buckles, you can turn a half lid into a full-face in a matter of seconds, without even removing the helmet. The idea is to pop the chin bar on for extended descents. In half-lid mode it’s pretty much identical to the popular Bell Super, so even if you only bring the chin bar with you on a few of your most burly rides a year, it’s still an awesome option. Keep in mind, though, that the Super 2R is best run with goggles. If you prefer wearing sunglasses for eye protection, you’ll want to make sure the fit works for you. We’ve found that some folks have issue with clearance around the temple area when wearing sunglasses. Other than this one issue, it’s been a favorite among staff members. It’s lightweight, well built, well- ventilated, and it fits perfectly under a Christmas tree.